More working adults are choosing to make the switch to teaching, and school principals say they welcome their arrival. The proportion of mid-career teachers has grown from 15 per cent of the teaching force in 2002 to nearly 25 per cent last year. There are now 33,000 teachers. The proportion is even higher for recent hires. On average, 35 per cent of those hired in the last three years had at least three years of working experience, said the Education Ministry. The top five areas they came from were other parts of the public service, tertiary and private education institutions, health and social services, the financial sector and manufacturing. About half were over 40 years old when they switched to teaching and close to 70 per cent are women. "Those with working experience elsewhere bring with them different perspectives that have helped enrich learning in our schools," said a ministry spokesman. Siglap Secondary principal Low Joo Hong said 15 per cent of his staff of about 70 are mid-career teachers, and many enrich their teaching by bringing their previous work experience into their lessons. "I find mid-career teachers more adaptable to the rigours of the initial phase of school life. This could be because of their prior experience and older age. Mid-career teachers often also come across as being more stable and more independent," he said. While close to a quarter of teachers are mid-career teachers, the figure is higher at independent schools. At Hwa Chong Institution, 35 per cent of its 400 teachers had prior work experience and came from banking, science research and IT jobs among others. Said principal Hon Chiew Weng: "They bring unique expertise from their work experience into the classroom. This enhances the quality of interaction, and students catch a glimpse of the working world." 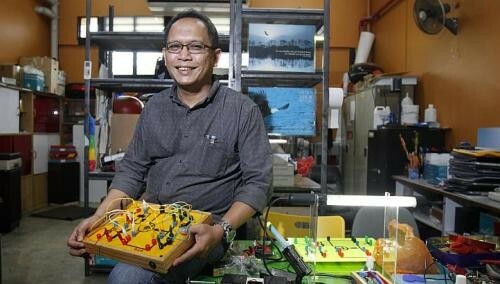 Physics teacher Lim Jit Ning, 54, recently won the national Crescendas Medal and Prize for Outstanding Physics Teacher (Junior Colleges), which recognises outstanding efforts and innovative ways of teaching the subject. Dr Lim was a researcher in US and Canadian universities from 1990 to 1995 and worked as a project manager for an IT company for eight years after returning to Singapore. It was through his volunteer work as a tutor with the Chinese Development Assistance Council that he discovered his love for teaching. "I found the tutoring job very satisfying and decided to become a full-time teacher. Now I use examples from my work as a scientist to emphasise the importance of broad-based learning," he said. Mrs Jesmine Lim, 45, spent 13 years as an IT systems development manager before staying at home to help her then eight- and 10-year-old sons with school work. It led her to a career switch when she was ready to return to work and she went for teacher training when she was 36 after a stint of contract teaching. "Teaching has always been my passion. My first 'teaching assignment' was giving tuition to primary school pupils when I was in junior college," she said. "I believe there is a season for everything. My IT industry experience really adds value to my current job in many areas which are unmeasurable," said Mrs Lim, who now teaches Chinese at Singapore Chinese Girls' School. Former engineer Iskandar Asmon, 50, said he thought of teaching as a way to give back to society and make a difference, but was worried he would not be successful because of his age. He was 48 when he made the change and was pleasantly surprised to be accepted. He went through a year's training at the National Institute of Education (NIE) and has been teaching design and technology at Siglap Secondary for six months. "As a former engineer, I find that I'm able to help students see the connection in what they're doing, especially in their project work," he said. Ms Diana Toh, 43, wanted to be a teacher but landed in a bank instead, stayed for 18 years and rose to be an assistant vice-president. But she met with a serious accident in 2009 involving a motorist who made an illegal turn. The front of her car was flattened. She thinks it was nothing short of miraculous that she escaped with only a sprained back and shoulder, which needed six months to heal. During that time, the mother of one, who is married to a secondary school teacher, thought hard about what she wanted to do in her life. Despite having to take a big pay cut, "teaching was the obvious choice". She will graduate from NIE this year and be a PE and maths teacher in a primary school. She said the communication and relationship skills she picked up in banking will come in useful. And having already done teaching stints in schools, she has this to say: "Don't trust the recruitment advertisement totally. Yes, there will be a lot of heartwarming times but there will also be lots of heartbreaking and hair-pulling times. "If you are entering the teaching fraternity as a retirement plan, this is not the place to be. But if you love children and have their welfare at heart, then give it a try. It will be very rewarding."